SINGAPORE - Singapore's non-oil domestic exports (NODX) slid sharply in July, much worse than expected, as global demand showed no signs of recovering, according to figures released on Wednesday (Aug 17) by International Enterprise (IE) Singapore. NODX last month sank 10.6 per cent from a year earlier - sharper than the 2.5 per cent decline expected by economists in a Reuters poll and the 2.4 per cent contraction in June. Shipments fell to all of Singapore's top 10 markets, except the EU 28, with the worst hit being China, the US and Indonesia. On a month-on-month, seasonally adjusted basis, non-oil domestic exports in July fell by 1.8 per cent, extending the previous month's 13.0 per cent contraction, as both electronic and non-electronic shipments slumped. Singapore last week pared its economic growth forecast for 2016 on concerns that Britain's vote to leave the European Union could further dampen global demand. On the same day, IE Singapore forecast that Singapore's export slump would ease in the second half of this year, though trade would remain in negative territory. It forecast NODX would shrink by 3 to 4 per cent this year, compared to its earlier projection of a 3 to 5 per cent contraction. July shipments to China - Singapore's singe biggest export market - fell 16.6 per cent, after a 9.9 per cent contraction in June, led by petrochemicals (-26.7 per cent), primary chemicals (-26.6 per cent) and specialised machinery (-15.7 per cent). NODX to the US tumbled by 19.1 per cent, reversing a rise of 5.9 per cent in June, due to pharmaceuticals (-54.4 per cent), ICs (-38.0 per cent) and diodes & transistors (-36.4 per cent). Shipments to Indonesia contracted by 22.6 per cent, adding to a 15.9 per cent decline in the previous month, due to petrochemicals (-48.2 per cent) civil engineering equipment parts (-41.3 per cent) and primary chemicals (-45.4 per cent). 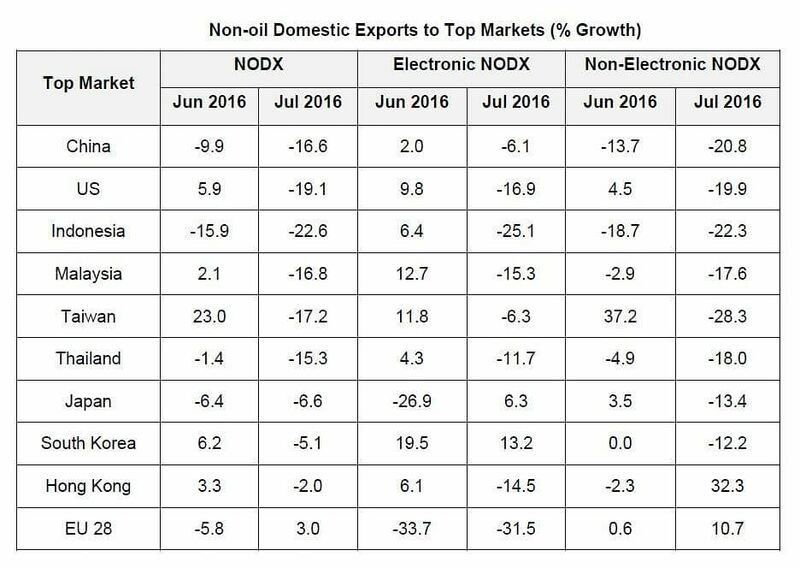 Electronic NODX contracted by 12.9 per cent year on year in July, following the 1.7 per cent decline in June. The decrease was largely due to PCs (-36.0 per cent), parts of ICs (-46.3 per cent) and diodes & transistors (-19.5 per cent). Non-electronic shipments shrank by 9.5 per cent, after the 2.6 per cent contraction in June. The decline was led by petrochemicals (-35.0 per cent), civil engineering equipment parts (-58.3 per cent) and specialised machinery (-16.7 per cent). Total trade in July fell 11.1 per cent from a year earlier, following the 5.1 per cent decrease in the previous month. Total exports contracted by 10.3 per cent, after a 3.7 per cent decline in June. Total imports decreased by 12.1 per cent, following the 6.7 per cent contraction in the preceding month.